This set was thoughtfully sourced and procured for you by Bash+Boogie. 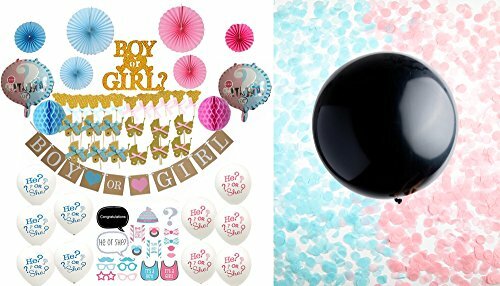 LARGE (36 INCH) BLACK GENDER REVEAL BALLOON TO FILL WITH INCLUDED PINK OR BLUE CONFETTI Pop to reveal the gender of the new baby with an explosion of confetti and create unforgettable memories for the mom and dad to be!! COORDINATED PINK AND BLUE MATCHING BALLOONS, BANNER, FANS, AND HONEYCOMB BALLS CONVENIENTLY PACKAGED IN ONE SET. Your guests will absolutely love the caring and creativity you put into their baby shower and you can focus on showering them with love and well-wishes! PRETTY MATCHING GLITTERY GOLD "BOY OR GIRL?" CAKE TOPPER + 12 BABY CARRIAGE AND 12 ONESIE CUPCAKE TOPPERS WITH BLUE OR PINK RIBBON for a dazzling table centerpiece that coordinates beautifully with the decorations! 10 WHIMSICAL PINK AND BLUE PRINTED "HE OR SHE?" BALLOONS to build excitement for the Mom-and-Dad-to-be and keep guests guessing! 2 GORGEOUS "GIRL OR BOY?" MYLAR BALLOONS for that extra special shimmering touch and 20 ADORABLE PHOTO BOOTH PROPS sure to entertain guests and keep the party going! If you have any questions about this product by Bash+Boogie, contact us by completing and submitting the form below. If you are looking for a specif part number, please include it with your message.